It’s 500 years in the future, and a mad cow-like disease called “Bent Head” has killed off most of the U.S. population. Those remaining turn to magic and sacrifice to cleanse the Earth. 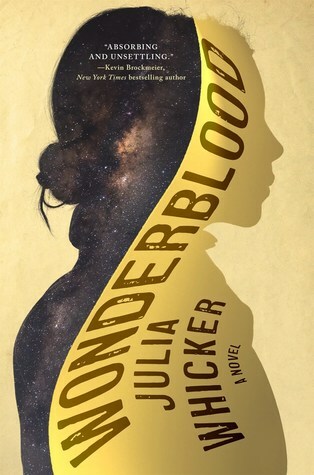 Wonderblood is Julia Whicker’s fascinating literary debut, set in a barren United States, an apocalyptic wasteland where warring factions compete for control of the land in strange and dangerous carnivals. A mad cow-like disease called “Bent Head” has killed off millions. Those who remain worship the ruins of NASA’s space shuttles, and Cape Canaveral is their Mecca. Medicine and science have been rejected in favor of magic, prophecy, and blood sacrifice. When traveling marauders led by the bloodthirsty Mr. Capulatio invade her camp, a young girl named Aurora is taken captive as his bride and forced to join his band on their journey to Cape Canaveral. As war nears, she must decide if she is willing to become her captor’s queen. But then other queens emerge, some grotesque and others aggrieved, and not all are pleased with the girl’s ascent. Politics and survival are at the centre of this ravishing novel. Wonderblood by Julia Whicker is a frightening, gross, and devastating tale. Loss, grief, and chaos loomed ahead in this read. The world went from how we knew it to one unrecognizable to me. Death. blood, gore, and sacrifice were everywhere. The story was strange. It was worse than any apocalypse novel that I have ever read. I couldn’t tell if they were any heroes, or if they were all just a bunch of lost souls too damaged by the destruction of their world. I would recommend this book if one is into the weird and unforgettable darkness that consumes long time afterwards. Wonderblood was a very dark read.